D4s, 18mm, f6.3, ISO560, 1/400th. What a nice surprise. Clicking on one elephant gets me an image of two!! 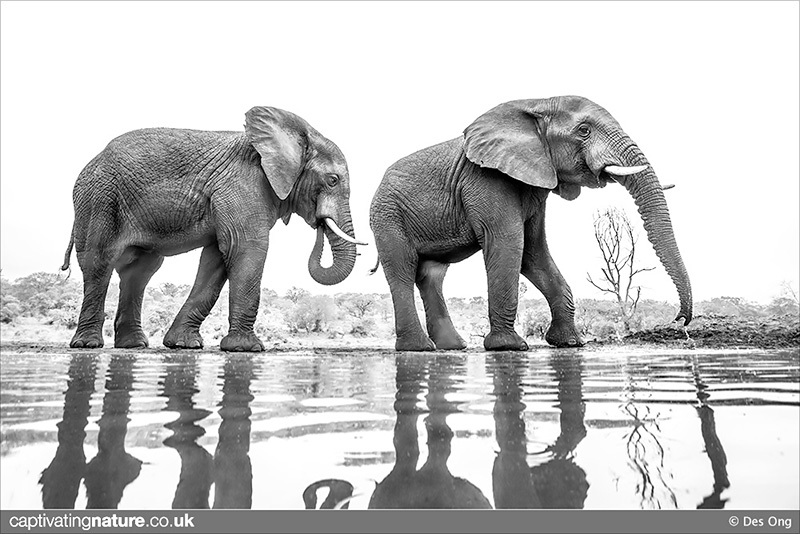 I always like elephants in B&W. Great presentation. Super low perspective, Des. And I like the high key presentation. You have to click on this one and bring in the dark surround to see it at its best! Nicely done, Des. not too fond of the cut reflection as you are neither here nor there, taking off 2/3rds of the reflection would be "more" IMO, granted it wasn't possible to show it complete? Marc, thanks for your input, but your crop suggestion doesn't work for me. No, it wasn't possible to 'show it all' as this is full frame at 18mm. Lovely B&W presentation. I like their relative positions-this really tells the story. No problem Des, to each their own.